mtDNA is a circular structure composed of 16,569 nucleotides, also called base pairs (13 genes). (It is believed that the mitochondria were originally parasitic bacteria which, through evolution, became symbiotic with the human cell and then became an integral part of the cell; bacterium DNA is circular.) There is a 540 base-pair section labeled 16001-16540 that evolves faster than other sections, so it is used to distinguish human groups that evolved separately. In the table below there are two sets of four rows that list the 540 base pairs: the first row starts at position 16001 and ends at 16100, the second row encompasses 16101-16200, the third row encompasses 16201-16300, the fourth row encompasses 16301-16400, the fifth row encompasses 16401-16500 and the fourth row encompasses 16501-16540. The Cambridge Reference Sequence (CRS) is the sequence of base pairs for a specific person to which all other persons are compared. What Does Measuring Your mtDNA Tell You? Average number of mtDNA base pairs differences between two humans is about 10-66. The HVR1 test indicates to which of the major 36 World (10 for 99% of Europeans) haplogroups you belong. This could be millions of people! If it is a rare haplogroup, it could be a much smaller group. Mine is haplogroup I (Iris), in which are <2% of Europeans. This is most helpful for genealogy when you think you are related to someone through your maternal line. Test HVR1 for both to see if they are the same; if the same there is a 50% probability that you have a common ancestor 52 generations ago or less. For better resolution, do the HVR2 test; if still the same there is a 50% probability that you have a common ancestor 28 generations ago or less. So, it is not accurate enough for genealogy. Full sequencing of mtDNA is equivalent to 41 markers on the Y-chromosome for genealogical use in the strict female line. It is difficult to follow a maternal line back many generations, since surnames usually change each generation. The 199C and 250C mutations define the haplogroup I1a, along with the three HVR1 mutations given above (16129A, 16223T, 16291A). The following table shows the CRS and my mutations below the relevant location in red. So, in total for both HVR1 and HVR2, my mtDNA has 18 relative mutations with CRS. I am in mtDNA haplogroup I1a, as shown in http://www.journals.uchicago.edu/AJHG/journal/issues/v68n6/002593/fg2.h.gif and http://www.ancientrootsresearch.com/Hap-I/Members.html#News. 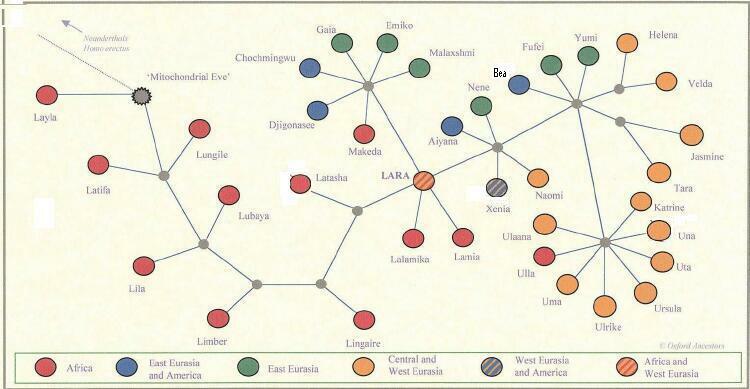 Note at the top left the mutations at locations 16129 and 16391 define the haplogroup, and the mutations at locations 16172 and 16311 define the I1 branch of I. In addition, I have mutations at locations 16085 and 16223; the 16223 one is the branching off from the African outgroup; the 16085 one defines a subbranch of I1 called I1a. Note the genetic closeness of the I haplogroup to the X haplogroup, which is Asian and Native American (the late arrivals). 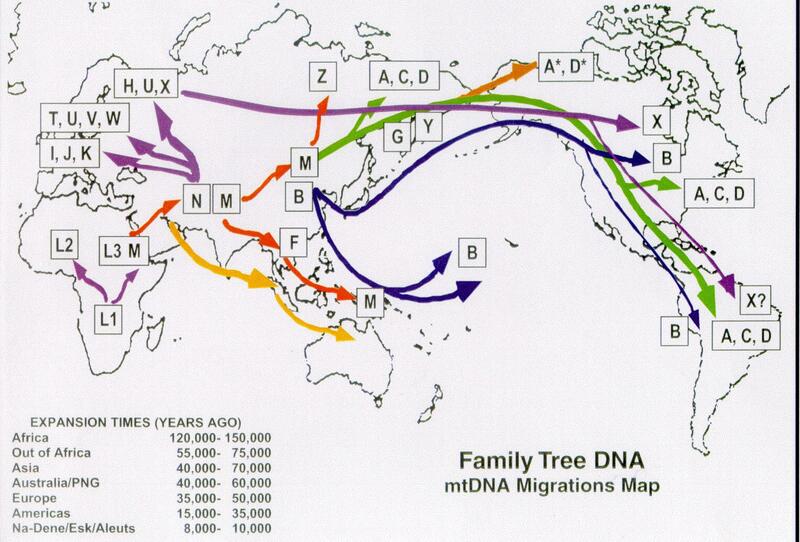 Perhaps this is part of the reasons my Biogeographice genetic test (DNAPrint) show 17% East Asian. Note that, in this study, haplogroup I, where my mtDNA lies, is 1.7% of the European population in this study and originated c26,000 ybp. Haplogroup I is found in north and east Europe, the Near East, the Caucasus, Egypt, Arabia and Northwest Africa..Haplogroup I is a subgroup of the Xenia haplogroup in Bryan Syke's book The Seven Daughters of Eve. For a more recent excellent discourse on mtDNA compared to Y-chromosome tests, see Bryan Sykes, Adam's Curse: A Future Without Men. See the haplogroup I web page of Bonnie Schrack for some details about the mother of I. 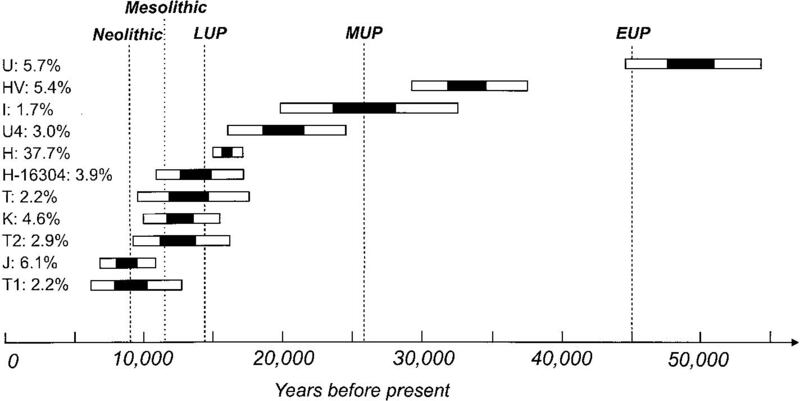 "Haplogroup I from north Asia generates what is probably the first major Paleolithic expansion to central Europe." View all known female descendants (and their husbands) of Sarah Hubbard (b c1700 VA d c1749 VA). See http://herkules.oulu.fi/isbn9514255674/html/x287.html for a tutorial about mtDNA. HVR1: Locations 16001 ending at 16540 = 540 base pairs (bp). HVR2: Locations 61 ending at 570 = 510 base pairs. Determine the coding-region (CR) mtDNA base pairs for several generations of living women who descend from the same woman. That is, determine CR mtDNA base pairs for a woman, her daughter, her granddaughter, her great-granddaughter and her great-great-granddaughter; surely there are existing such 6 generations of descent. If CR mutations increase with age, it should be seen in the 6 generations. Determine the CR mtDNA every year for many women from birth to death, to see if mutations occur and at what ages they occur most frequently. One can now get a full sequencing of mtDNA: http://www.familytreedna.com/description.html#mtFullSequence. I did this; see above. So, a full mtDNA comparison for two individuals in a female line would give a tighter comparison of their relationship than does 37 Y markers in a male line. However, there are diseases associated with some genes on mtDNA. So, measuring the full mtDNA in order to compare two females to see if they are in the same female line might reveal that one or both are susceptible to a specific disease. That is, private information might be revealed. Also, at the 2nd ICGG it was stated that using autosomal DNA for genealogy would not yield useful information any further back than 4 generations. It was predicted than within the next decade a full genome sequence would cost about $1,000. In 2005 it costs about $2x10^6. In five years it will be about $10,000.